Spaceboy children's apron - spacekids - space toys, dressing up costumes, kids spacesuits, astronaut food, cool space stuff! 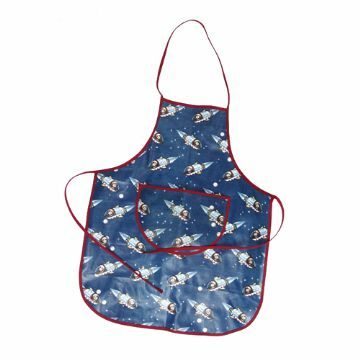 Spaceboy design printed oil cloth cotton childrens apron, in blue spaceboy designs with red edging, handy front pocket, adjustable cotton ties around the waist. The perfect cover from all those nasty spills. One size only. Care Instructions: Wipe clean with a neutral detergent . Do not wash, iron, bleach, tumble dry or dry clean. KEEP AWAY FROM FIRE.